Today I would like to show you a book I have in my possession.It is a pretty little book and has been making its mark in the world of embroidery since 2005. Here it is..
Like everyone else, I love a good cover - if the cover manages to grab my attention,then the book has to be checked out . Three Dimensional embroidery stitches has been published by Search Press and the author is Pat Trott. 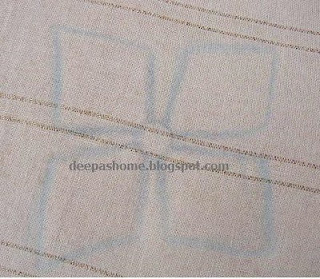 I happened to find this in one of the Indian websites while looking around for embroidery books . The cost seemed to be reasonable (approx 500 Rs with discount) and so I ordered it online. The list price on the book says $17.95. Affordable, me thinks. First and foremost - this is a small book - only about 64 pages. The pages are glossy and the photographs are all in color. I assume that the author and the publishers have tried to balance between the price and the quality of the contents. Like in majority of embroidery books, Pat also starts off by giving a description of the materials needed for the projects in the books. She suggests a variety of threads to bring in texture and dimension to the embroidery. Additionally, she advocates usage of various elements for padding and fabric colors for depth. Next comes the stitches. Seventeen stitches have been explained with step by step photographs. The font in these pages are large enough for comfortable reading and each step is explained well. Then comes the floral sampler. Using the dimensional stitches 13 different flowers have been presented. Those who are well versed with dimensional embroidery may find some of the flowers familiar. Coming to the projects, what do you think about this one? Well, the pics above are two of the projects in the book. Good one's aren't they? Along with the seventeen stitches, the author also teaches us how to create dimensional pebbles,rocks and textured tree trunks required for these projects. It is my wish to attempt one of these sometime in future. Negatives?? Of the seventeen stitches I knew quite a few - almost 13 :). But I've been doing dimensional embroidery for almost 5 years,so that shouldn't be surprising. Beginners and those who want to learn how to create textures and dimension in their embroidery will surely find it useful. Overall, I am quite happy with this purchase of mine and feel that it is worth every penny I paid for it. What do you think? I have this book as well and like it very much too. thats a good review and the book seems worthy! I've been eyeing this book but have yet to get my hands on a copy to see if I want to add it to my collection so your review is a great help! I will be adding it to my wish list for sure. I stitched a wattle tree and used the raised stem band for the trunk. I also just wrapped some of the smaller branches, and couched the twigs. I did not try to work the stitching perfectly, but randomly and used different threads. it is on my blog under creative embroidery. It is very nice to look at this book through your eyes. The photographs are amazing and also the stitches! Where i can get this book at India dear? I've mailed you.Hope you've got it. I bought it online from rediff when there was a discount.Now I think it costs about 800+ in rediff .If you know Odyssey bookstore you can get it there. Flipkart.com has a good offer of 482/- if you're interested in buying online.